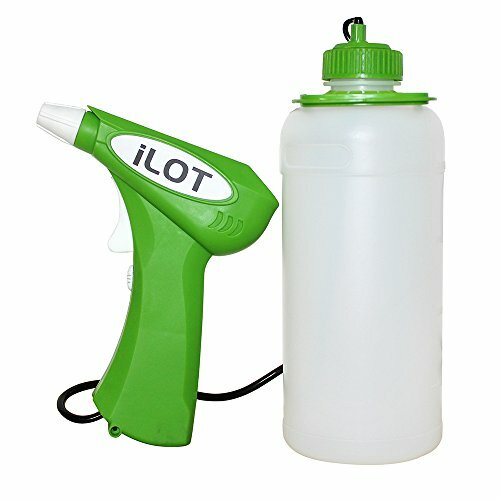 iLOT FET001 Battery-operated Garden Sprayer with 32oz Bottle for Various Cleaning, Pest Control, Insecticide and Fertilizer in Home, Lawn and Garden Green, Powered by 4*AA Battery(Battery not Included), no need pumping any more, spraying without hand fatigue, every family need one of this. It can be used for almost all spraying chemicals in home and garden, both for concentrate and ready-to-use liquid, like weed killers, herbicide, carpet cleaner, bleach, disinfectant, detergent, wash and wax formula, fungicide etc. And, even old person and arthritis can use this very easily. 3. IF THE SPRAY IS INCONSISTENT, the nozzle and/or the pickup tube filter may be partially blocked. Remove the nozzle by twisting past the X marker. Flush with warm water and twist the nozzle back onto sprayer. 4. DO NOT MIX NEW BATTERIES WITH OLD. Do not mix alkaline batteries with standard or rechargeable batteries. 4) Twist gently when adjusting nozzle. Don't over tighten. 1 YEAR GUARANTEED. Please ask us replacement if product have quality problem with your order number. No Pumping Needed, Spraying Without Hand Fatigue. Twist the Nozzle to Get 2 Different Spraying Mode in Mist or Streamline. 2-in-1 Usage. Fits directly to Ready-to-Use Chemical Bottle (Closure Size 38mm, Fits Most Milk Bottle); Or Use this 32oz Bottle for Diluted Concentrate Chemicals, Like Weed Killer, Bleach, Fertilizer, Disinfectant, Fungicide and Carpet Cleaner etc. Suitable for Most Indoor or Outdoor Spraying Application. 1 YEAR WARRANTY---Please follow the User Manual When you found the problems in use, it provide you solution for MOST problems you may have. We will provide you 1 year guarantee for this item, if there is a quality problem, we will provide you 1pc replacement FOR FREE. If you have any questions about this product by iLOT, contact us by completing and submitting the form below. If you are looking for a specif part number, please include it with your message.